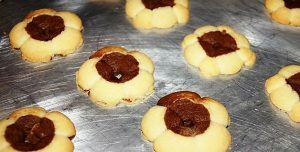 Recipe #6 in our 2012 edition of the 12 Days of Christmas Cookies. Chocolate in the center of vanilla dough lends a new twist to a holiday classic cookie. Melt chocolate in small heavy saucepan over low heat, stirring constantly; set aside. Beat butter and sugar in large bowl until light and fluffy. Beat in egg and vanilla. Combine flour and salt in medium bowl; gradually add to butter mixture. Reserve 2 cups dough. Beat chocolate into dough in bowl until smooth. Cover both doughs and refrigerate until firm enough to handle, about 20 minutes. Roll out vanilla dough between two sheets of waxed paper to 1/2-inch thickness. Cut into 5×4-inch rectangles. 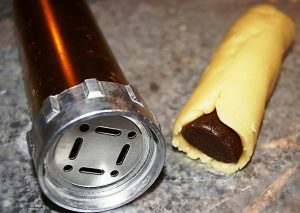 Place chocolate dough on sheet of waxed paper. Using waxed paper to hold dough, roll back and forth to form a log about 1 inch in diameter. Cut into 5-inch long logs. Place chocolate log in center of vanilla rectangle. Wrap vanilla dough around log. Press dough onto ungreased cookie sheets 1 1/2 inches apart. Bake about 10 minutes or until just set. Remove cookies with spatula to wire racks; cool completely.